As some people may already know, my Moo pictures have been used for some of the amazing White Star Running events which has been great for me and my Moo's are certainly becoming more and more recognisable! 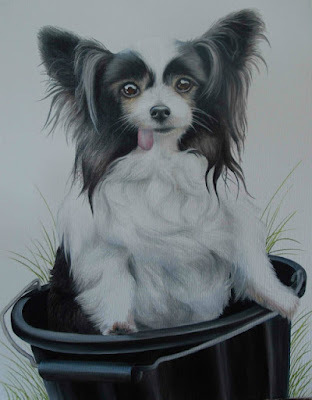 Grant had seen my work at the events and online so got in touch to see if I could do a Portrait of his Papillon, Lucky, as a surprise present for his wife, Kate. "We had him as a rescue dog, probably when he was 11 or 12 (The vet didn't know his exact age). He came to us after being mistreated by his original owners. He was missing lots of teeth (hence the tongue out) and he was very timid. It took several months for him to really settle in and be comfortable around people. He was our first ever dog. 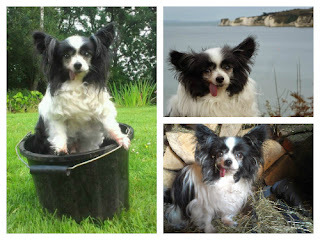 we never expected to have a dog with our work schedule and we had reservations about ‘old person’s’ small yappy dogs. As it turned out, he fitted in perfectly and changed our views on small dogs completely. So much so that when he had to be put to sleep at about 15 or so years of age we found ourselves with another Papillion, and YES his tongue hangs out too, but for different reasons to Lucky. So Lucky has lots of special memories for us which is why it was so nice to be able get a lasting memory of him in your painting." I dropped the painting round to Grant in secret a week before Kate's birthday so he had a hard task of keeping it secret!! When he finally got to give it to her this is what he said....."So I gave Kate the painting of Lucky and she loves it! Well, I assume she loves it through all the tears! The more we look at it the more of the amazing detail we see. It's so life like, almost 3d, and you really captured Lucky's cheeky character. Amazing."